This is a very significant site, perhaps the most symbolically significant site, in the history of the labor movement in the United States. Throughout the nation’s history, salaried workers, especially blue-collar laborers, have fought for higher wages and greater benefits. When the nation shifted from agricultural to industrial employment after the Civil War, prospects for unions improved since large numbers of workers got paid by a single employer. If the workers organized themselves and went out on strike, they could effectively cut off the flow of revenue to the owners. Some strikes could also inconvenience a significant fraction of the population and thereby got the government involved in a settlement. The rail workers unions were able to call strikes in the late Nineteenth Century and, by the 1920s, they had successfully pushed for federal legislation that strongly protected—and continue to protect—the interests of those who ran the nation’s trains. Steel workers and coal miners were successful in calling strikes in the late Nineteenth Century but faced greater challenges in becoming effective unions. Auto plants presented a great opportunity for those who believed that unions could improve the living and working conditions of America’s labor force. After Henry Ford demonstrated the value of the production line in 1914, vehicle plants started to employ thousands of workers at individual plants. Everyone knew that the auto sales fluctuated for one year to the next. If workers struck, they could shut down production. Management believed that they might never make up for the sales they lost in a strike since other producers raced in to fill order. Perhaps the first major plant to be organized in Detroit was the EMF factory on Piquette Street that produced Studebakers in tremendous numbers. The International Workers of the World gained considerable power there in about 1919, but ultimately, they could not form a powerful union. Eventually, Studebaker shifted most of their production to South Bend, Indiana. Unions were thwarted in almost all industries except rail transportation until the 1930s. Managements often argued that the constitutional right to private property and to write contract meant that they did not have to recognize unions. Perhaps, more importantly, managements had the power to influence legislators who passed laws making it very difficult or impossible for unions to organize workers. In quite a few cases in the late Nineteenth and Early Twentieth Century, management had such strong influence with governors that they had police officers or the National Guard called out to end strikes, often using very much force and violence. By the late 1920s, coal miners were reasonably well organized and the steel workers union was making considerable progress but unionization was rare in most industries. The idea of unionization, however, was clearly understood by both workers and management and was increasingly popular as more and more urban workers went to factory jobs. The union movement was active and there were also a few industries, in addition to railroads, with successful unions including cigar makers, shirt waist makers and musicians. President Franklin Roosevelt’s administration was generally favorable to the interests of labor and the working class during the Depression. In a radical change from the past, Congress, in 1935, passed the Wagner Act that mandated that employers recognize and bargain with legitimately organized union. Managements, not surprisingly, argued that this was an unconstitutional law since it violated the property rights of owners. They promised to fight it in the courts and many of them proclaimed that they would never recognize a union. In a time of great labor surplus such as the Depression, unions typically have little power. If they call a strike, they do little damage to the management since their workers are hardly needed and it was easy for owners to find substitute workers. When the United Auto Workers first attempted to organize vehicle plants, this was the case. However, the economy took an upward turn in 1937 and, for the first time since, 1929, cars began to sell in large numbers. The United Auto Workers saw their opportunity. If they struck at this time, they would curtail the first profits that firms had made in almost a decade. Their strategy was the sit-down strike. Workers went into the plant, sat down for days on end and did no work. Family members and friends of workers sent in food, blankets and whatever the strikers needed. Since they were inside and occupying the plants, the auto firms could not easily hire replacement workers. Firms—especially General Motors—insisted that the police and the National Guard be called in to remove and then prosecute the trespassing workers who were illegally occupying private property. For the most part, mayors and governors were reluctant to send in the police or the National Guard. They, on the one hand, feared violence and bloodshed but, on the other, they knew that workers cast many thousand more votes that did the owners of firms. In early 1937, General Motors agreed to recognize the United Auto Workers as a bargaining agent and a major sit-down strike in Flint. Chrysler—and many of the major part suppliers—were also hit by sit-down strikes and, after a few weeks or less, they agreed to abide by the Wagner Act. Ford, however, held out and did not recognize the United Auto Workers until the start of World War II. The successful unionization of vehicle plants in the late 1930s set a precedent for the unionization of workers in many or most other industries. Employers eventually agreed to comply with the Wagner Act and recognize unions. The union movement in the United States became powerful because of developments in Detroit; namely the successful efforts of the UAW to organize most vehicle manufacturers and their suppliers and the later success of the James Hoffa and the Teamsters’ Union. That union was not headquartered in Detroit but Mr. Hoffa’s base of power was in the Motor City. It was one thing for unions to be recognized as bargaining agents for workers. It was quite another thing for unions to win the benefits their members sought. In the late 1930s—as the economy sunk once again after an upturn in 1937—unions won few gains. Manufacturers were not very profitable and surplus labor made it easy to replace strikers and disgruntled employees. During the early 1940s, the situation was very different since the defense production meant that most firms faced the problem of a shortage of labor. Furthermore, the government successfully defined labor-management conflict as unpatriotic when wars were being fought in both the European and Asian theaters. After World War II, the stage was set for bitter labor-management conflict in many industries. Workers felt that they had sacrificed during the war by foregoing wage increases and working many seven day weeks for the war efforts. They demanded substantial increases in pay and benefits. Management, on the other hand, listened to the many economists who, after World War II, erroneously predicted that a period of brief prosperity would be followed by a resumption of the great Depression. They assumed the fundamental problems that caused the Depression would manifest themselves after a short economic boom so manufactures thought they had good reasons to keep wages low. Automobile sales accelerated right after World War II. The pent-up demand for cars was great and producers could not turn them out fast enough. The waiting time for many models was one year or greater. The UAW knew that this was an ideal time to make their demands. By going on strike at one or two plants, the UAW could stop almost all production for a major firm. In 1946 and 1947, the UAW very effectively used such strikes to curtail production when many cars were selling at much above list price. Management, for the most part, took a hard line but quickly they learned they workers had the upper hand in this bitter conflict. The years immediately after World War II witnessed persistent labor-management conflict, even though it was an era of great economic prosperity. Management and those opposed to the interests of labor sought to contain the power of unions. One major way was through legislation. Congress – and state legislatures—could enact measures that either make it quite easy or extremely difficult for unions to organize. And elected politicians could appoint judges who either strongly supported or opposed the interests of labor unions. Over the extremely strong opposition of President Truman and a united Democratic Party, the Republicans in Congress in 1947, passed the Taft-Hartley Law that sought to greatly restrict the power of unions. Labor’s support for President Truman helps to explain his surprise victory in the 1948 presidential election. This was, perhaps, one of the most lucid examples of the electoral power of the American labor movement. The “Treaty of Detroit” was signed by the UAW and the Big Three auto producers in 1948. This was an historic event in the history of American labor. 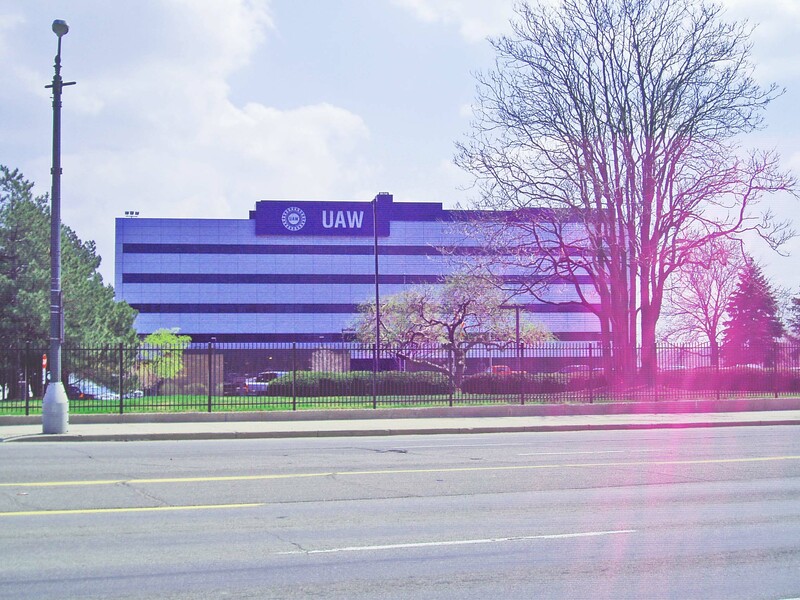 The UAW pretty much agreed to call off their highly successful program of frequent strikes and the large auto firms agreed to many of the demands of labor. That set a precedent for many later contracts and eventually provided blue collar workers with the benefits we associate with the Scandinavian democracies including wage increases indexed to inflation; employer paid health insurance for workers and their dependents, supplemental unemployment benefits for the long-term unemployed, extensive vacations and numerous paid holidays including a worker’s birthday and the first day of deer hunting season in Michigan; employer paid retirement benefits; work rules that encouraged maximum staffing and management pay for many who carried out the union’s business such as shop stewards. The United Auto Workers became extremely powerful as the demand for vehicles continued at a high level. They were able to win generous contacts for the numerous firms that supplied the car companies. Indeed, throughout industrial American, the benefits won by the UAW became a standard package that other unions sought and, frequently, won from employers. In Midwestern states with their numerous auto plants, many legislators owed their electoral victories to the votes of union families. Once in office, they typically promoted similar benefits for state and local employees. The success of the UAW in the years shortly after World War II provided tremendous economic security to the nation’s blue collar workers, at least those in the major industries and to many public sector employers. The UAW contract were a model for employee benefits provided by many employers. Success, however, was not achieved easily by the UAW. They confronted many challenges over the years since management were not going to easily give in to the demands of their workers.. By the early 1950s, Senator Joseph McCarthy was one of numerous strong voices condemning unions for being led by individuals who, he asserted, were sympatric to Communism. Within the UAW, this was a controversial issue since the largest local, Local #600 at the Ford River Rouge plant, more or less fit the stereotype that Senator McCarthy and many conservatives sought to popularize. Walter Reuther held leadership positions in the UAW from the 1930s until his death in May, 1970. He had many confrontations with union leaders about the issue of how much influence did the radical left have in the UAW. Perhaps it is not much of an overstatement to content that Walter Reuther purged from the UAW many potential leaders who had strong times to Communist groups in the 1930s and 1940s. The United Auto Workers became the largest single financial supporter of the Democratic Party in the post-World War II era. Democratic presidential candidates from Harry Truman through Lyndon Johnson began their national campaigns with a Labor Day rally in Detroit since that was the city where they obtain their greatest financial backing. The UAW also strongly supported the Civil Rights Revolution in the 1960s. Despite extremely opposition from locals in the South whose leaders wished to preserve the Jim Crow system in employment, the UAW supported equal racial opportunities in employment. Indeed, the major source of financial support for Dr. Martin Luther King’s August 28, 1963 March on Washington was the United Auto Workers. By 2011, the UAW was, numerically and in terms of political influence, a shadow of it former organization. They had little success in organizing the plants of the foreign producers which were located, with few exceptions, in the South. Technological developments also meant that vehicles could be produced with relatively few workers. The economic disaster of 2008 and the bankruptcies of General Motors and Chrysler also took a great toll on UAW enrollment. Nevertheless, the UAW remains, arguably, the most power labor organization in the United States and continues to promote the economic interest of labor, at least those of organized labor. Solidarity House was built in a very desirable location on Detroit’s riverfront at a time when the United Auto Workers were still celebrating their very favorable victory in a struggle with General Motors, Chrysler and Ford. The architectural style was typical of that era.